Hotels are places where people from far away come and stay during the course of a vacation or a business trip. Whatever be the reason for lodging, they expect their stay to be a relaxing and secure one. Accurascan, the OCR mobile app, helps to fulfill the desired experience that the hotel guests seek. To create a safe and cozy ambience in a hotel, some safety measures are to be undertaken. Accurascan is one such app that helps hotel owners to achieve this target easily in a cost-efficient way. Let us see how this document scanning app can play a vital role in ensuring the security of hotels. Accurascan can be used for easy and quick guest check-in as the manual typing work of the front desk executives can be replaced by scanning guest documents with the app. This reduces a lot of time and eliminates the chances of human error which otherwise would lead to future reference hassles. The quick guest check-in also helps in enhancing the guest experience and creates a positive impression. It is not necessary that menace will originate through unwelcome hotel guests only. Which is why, it essential to scan the documents of visitors, laborers, technicians etc. apart from guests. If the practice of scanning through Accurascan can be extended to other entrants as well, it is possible to reinforce the security of a hotel. Accurascan is compatible with Web, Android and iOS platforms. It comes with an SDK/API that helps in integrating the app / web sdk with other existing in-house apps or Hotel Management Software. Its SDK/API is available for both mobile and web platforms. For example, if a hotel owns an app, Accurascan’s SDK can be used to integrate its own features into their app. This will help in strengthening the security system of a hotel even more in an inexpensive way. If you are a hotel owner trying to make your hotel a safe place for your guests, the above-mentioned roles of Accurascan would be of certain help to you. Secure your business reputation by embracing the advanced digital scanning solutions of Accurascan. 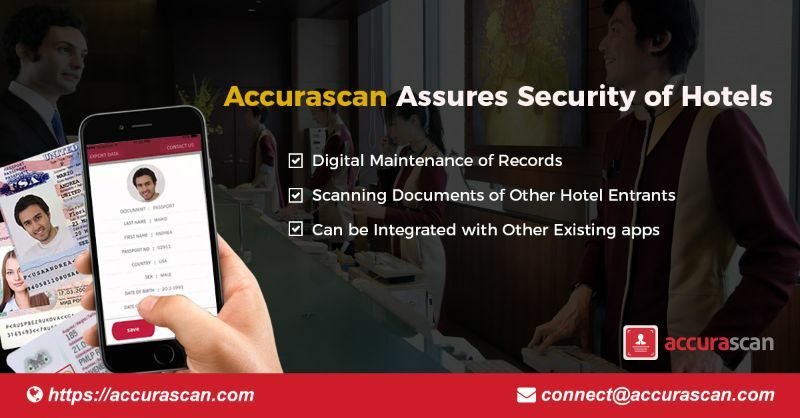 While Accurascan is available for a free trial, hotels can also opt for its paid version AccuraGo which is a ready-to-use scanning solution that runs on Android, iOS, and web platforms. The paid version is available at a reasonable monthly subscription fee.